Mental Health Support and Crisis Intervention for victims, survivors and families after an active assailant or hostile event looks different than a natural disaster response, because it is different. Your company, agency, community or region is the victim of a horrific incident. Emotional trauma is high with strong and broad impact. Vicarious trauma follows with constant news coverage and social media posts. These events become regional and/or national tragedies. Result: People are emotionally and mentally dazed, drained and confused. Historically, mental health crisis response is to setup support systems, advertise their existence and be available for anyone seeking help. Build it and they will come… But will they? Las Vegas, 1 October 2017. We all know what happened that night… Active shooter with 58 dead, 851 injured and lives forever changed. Bailey Schweitzer and her mother Crissy made a lady’s trip from California to the Route 91 Harvest Festival. A fun 3-day event. Country singer Jason Aldean begins his set at 9:40 PM as the final musical act of the festival. Somewhere between 10:05 PM and 10:15 PM, Bailey was shot in the collarbone. Crissy was carried away by bystanders as her daughter was laying on the ground calling out after her. Their family in California received a call Bailey was alive but only to be notified two hours later she had died. Bailey died without her mother. A week later the family had yet to know where Bailey was when she actually died. Related: What Is This Thing We Call Resilience? K9 First Responders (K9FR) was requested in the immediate aftermath of the shooting to assist Las Vegas Fire-Rescue, American Medical Response and MedicWest in supporting their personnel. Later in the week after a K9FR shift rotation, some of our teams went to the memorial site setup at the iconic “Welcome to Fabulous Las Vegas” sign to pay their respects. The sign is a couple of blocks away from the concert site and Mandalay Bay Hotel. It was there Handler William Gordon and K9 Clarence met Crissy Schweitzer. Crissy was at her daughter’s memorial cross. She saw K9 Clarence, immediately fell on top of him, and started sobbing. 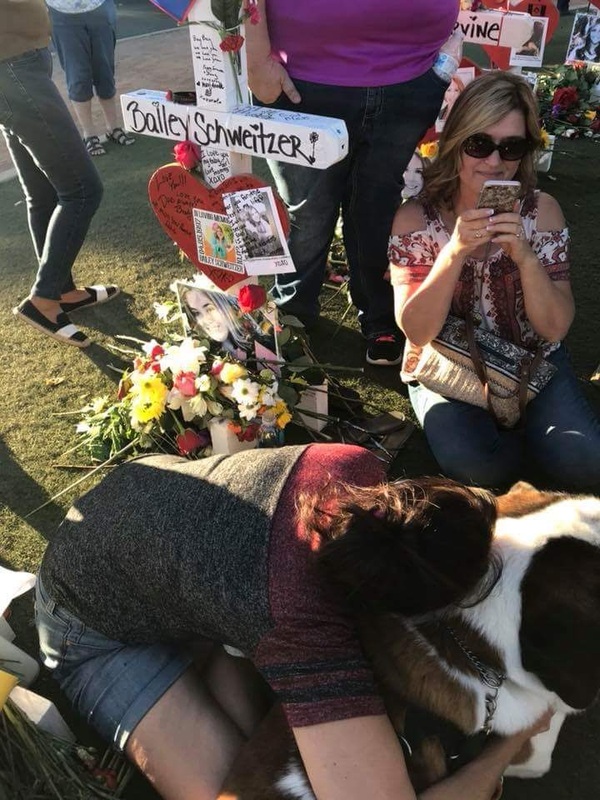 Crissy did not know where to be except at the only place she felt she could be with her daughter – Bailey’s memorial cross – and with others also experiencing the pain of loss. Hundreds of visitors, tourists and those who did not know where to be surrounded Crissy. Some were paying their respects. Others taking their photograph with Elvis with the memorial crosses in the background. 100 feet away was a wedding party taking their “post ceremony” photos in front of the iconic “Welcome to Fabulous Las Vegas” with flowers from around the world at the base of the sign. Surrealistic to say the least and adding to the emotional upheaval of the moment. During Handler Gordon and Crissy’s time together, he learned Crissy was from California and had come to Las Vegas for the concert. She had not reached out to the various mental health services made available after the shooting. Crissy was still overwhelmed by what happened to her and the loss of her daughter. The psychobiology of trauma. Those who aren’t trained in trauma informed crisis response, don’t understand many will not seek out help due to the psychobiology of a mass casualty incident (MCI). Self-help for those most impacted is not a realistic option. First Responders involved in the responses at Sandy Hook, Boston, Las Vegas and Parkland (among others) got together to learn from each other. The result was NFPA 3000. National Fire Protection Association (NFPA) published on May 1, 2018 the NFPA 3000, Standard for an Active Shooter/Hostile Event Response (ASHER) Program. This standard includes a pro-active trauma informed approach to response and recovery. NFPA 3000 applies to any community, authority having jurisdiction (AHJ), facility, and member of any organization who responds to or prepares for ASHER incidents. The first active shooter/hostile event standard to provide a framework for a unified response from fire, EMS and law enforcement. A notable highlight is the inclusion of a plan for aftercare and reunification using a Unified Command approach based upon lessons learned. And an important distinction… Recovery efforts during the response phase of a crisis. Takeaway: When a larger impact event happens to your community, aftercare and reunification need to be robust, pre-planned, exercised, and inclusive of a variety of public and community resources. • Identify and coordinate public and private recovery resources and implement under a single operational framework. • Inclusion with Family Assistance and Reunification Centers. • Assign a trauma informed ambassador to help shepherd victims to needed services… both short and long term. The result… groundwork for individual and community resilience. Authors Note: The personal story from Las Vegas is not to highlight any faults or to assign blame, because unless you, as a person or community, have experienced an active assailant or hostile event, it is difficult to plan for the realities of a response.